Buster Keaton caught by the camera in FILM (1965). Sometimes preservation can give a film a second life, or even inspire a movie about it. A case in point is FILM (1965), an avant-garde short that united two great 20th-century artists: Samuel Beckett and Buster Keaton. Producer Barney Rosset, founder of Grove Press and Beckett’s publisher, envisioned producing a trilogy of short films written by his most famous clients, but only Beckett’s script made it to the big screen. It remains the only movie written by the Nobel Prize–winning author/playwright, who closely supervised the Brooklyn-set production during his only trip to America. Director Alan Schneider was a longtime Beckett collaborator who had staged the first American production of Waiting for Godot, while the cinematographer was Oscar-winner Boris Kaufman (On the Waterfront). 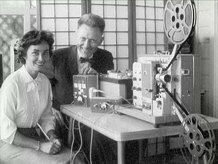 In 2006 UCLA Film & Television Archive received an Avant-Garde Masters Grant to preserve FILM. Administered by the NFPF and made possible through The Film Foundation, the AGM grants, now in their 13th year, are designed to preserve significant examples of America's avant-garde film heritage. Since FILM’s original negative was lost, the archive worked from a 35mm fine grain master, along with positive prints from the British Film Institute and Barney Rosset. New preservation masters, along with answer and release prints, were created by Cinetech, and the soundtrack was restored by DJ Audio and Audio Mechanics. The results premiered at UCLA’s biennial Festival of Preservation in 2011. The archivist in charge of UCLA’s preservation project was Ross Lipman, who has created NOTFILM, a documentary, or “kino-essay” as he calls it, about Beckett and Keaton’s collaboration. Making use of interviews with film historians Kevin Brownlow and Leonard Maltin (who visited the set), outtakes (including an eight-minute prologue later removed at Beckett’s suggestion), and tape-recorded production meetings, Lipman provides a behind-the-scenes examination of FILM and contextualizes its place in the careers of its makers. NOTFILM has met with enthusiastic response in The New York Times, The Los Angeles Times, The New Yorker, and Film Comment. Milestone Films is now distributing NOTFILM in venues across the country and will eventually release it on DVD alongside FILM.